Welcome lovelies. 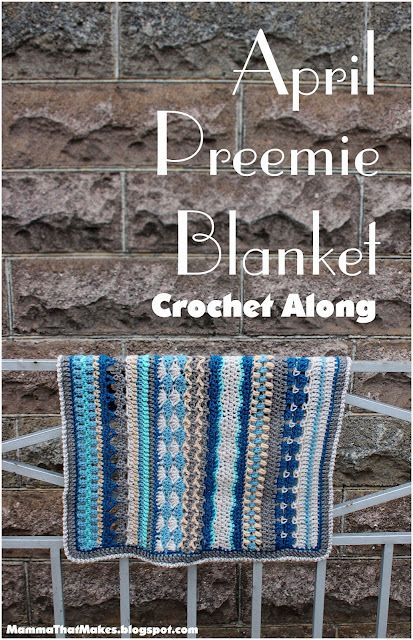 Today, is the last day for our preemie blanket crochet along. It's been an incredible month, and I have thoroughly enjoyed each and every photo you have shared with me along the way. I am so happy that so many of you joined in and make these wee little blankets, played with stitches and had fun with colours. A word about upsizing. This pattern, is made in multiples of 12 (+2 for starting) so if you wanted to make it larger, you could add more chains to the start. 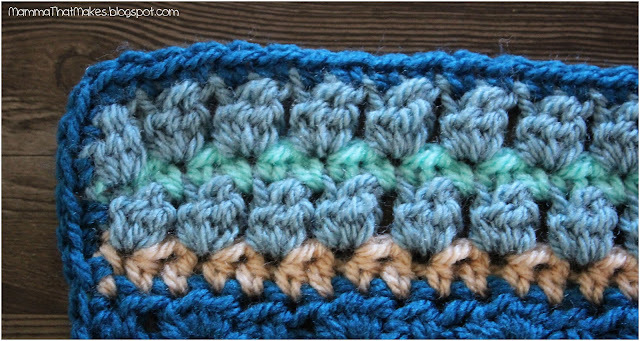 All of the solid sc/hdc/dc rows go back to 60 stitches, the entire pattern through. 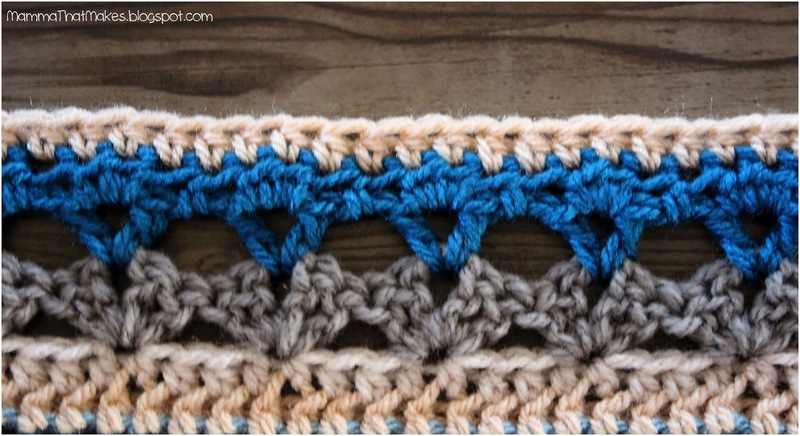 If you were to start with 132 stitches, then all of the sc/hdc/dc rows would also be 132. 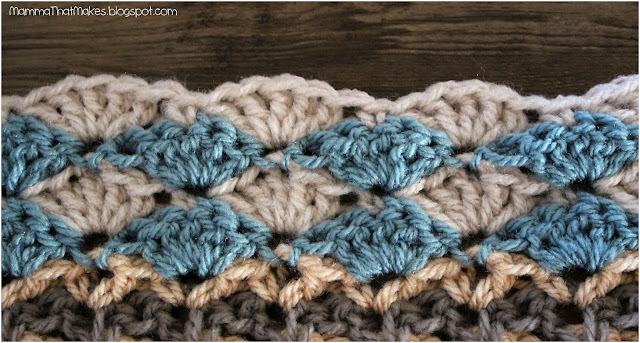 From here you can easily add length by picking the decorative stitch areas you like and putting them in between the solid rows. Let's get onto the last row, and then talk about blocking. DK/8ply/light worsted weight yarn in minimum of 6 colours. Yarn Note: I did not start with complete balls. All 6 of my balls were originally 100g balls with a little of each used. They are a mix of Stylecraft Special DK, King Cole Pricewise and Moda Vera Marvel 8ply for my 6 colours. 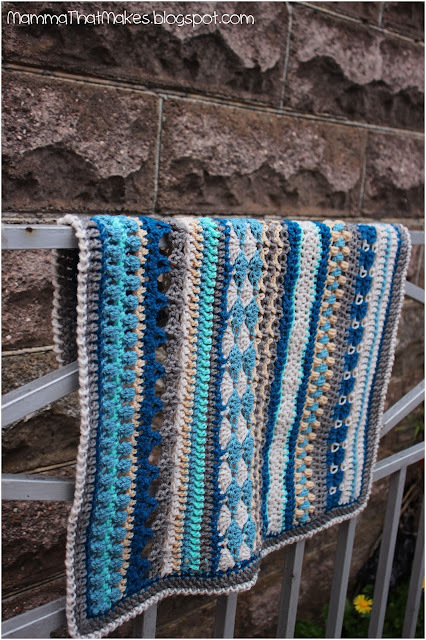 You could choose 6 colours and follow my colour changes, or you could make every line a different colour (excellent way to use scraps) or you could even use some self striping yarn, or a solid colour. 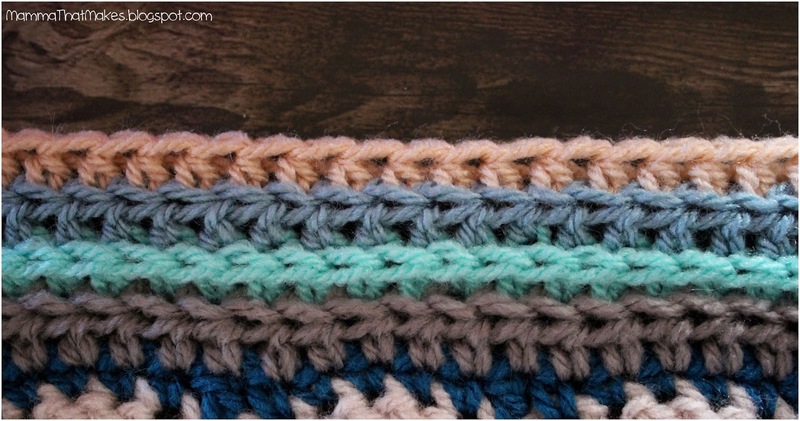 Colour Changes: I change my colours by completing the last yarn over and pull through of the last stitch in the row with the new colour for the next row, so I don't have to join with slip stitches. Of course, this means you'll have to redo that one last stitch each day as you won't know what colour is next, but the finished piece will be much neater this way. 45: Ch1, reverse sc (crab stitch) in each stitch around. Join to the first sc with a slst. End off and weave in all tails. I completely wet blocked my blanket. This is a must, because all the differing stitches pull the blanket in different ways. 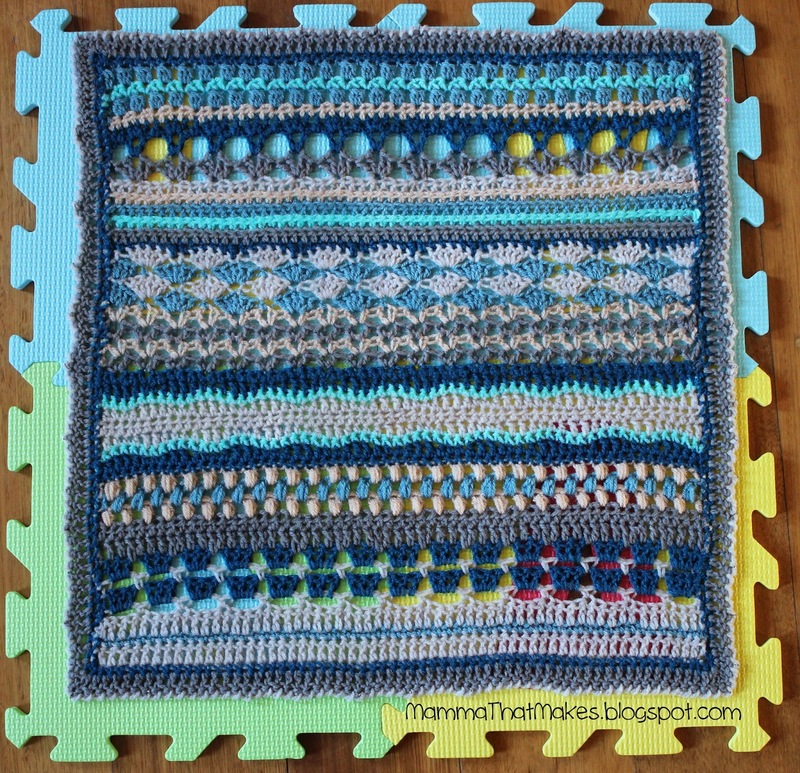 I blocked my piece to 50x53 cm, however the finished size will shrink back down slightly. Guys, this is it! That is the last step! Once your blanket is dry (mine took 2 days, sitting inside the porch) you can unpin it, and your blanket is finished and ready to be used. Like I mentioned at the start of this, my blanket is being sent to Chance's Clothes Project to be added to the bereavement packs they post to hospitals Australia wide. Maybe you'd like to send yours there too? I hope everyone had a blast making their blankets. 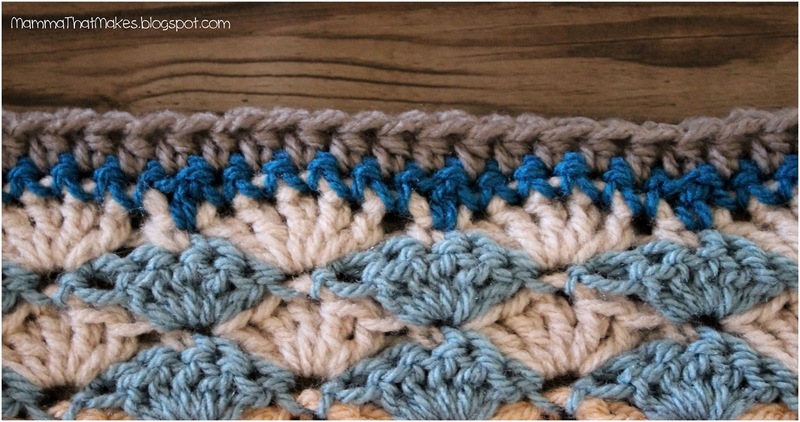 Do you want to see more crochet along's in the future? What kind? Let me know, because I had a lot of fun putting this one together for everyone, and would love to do some more! 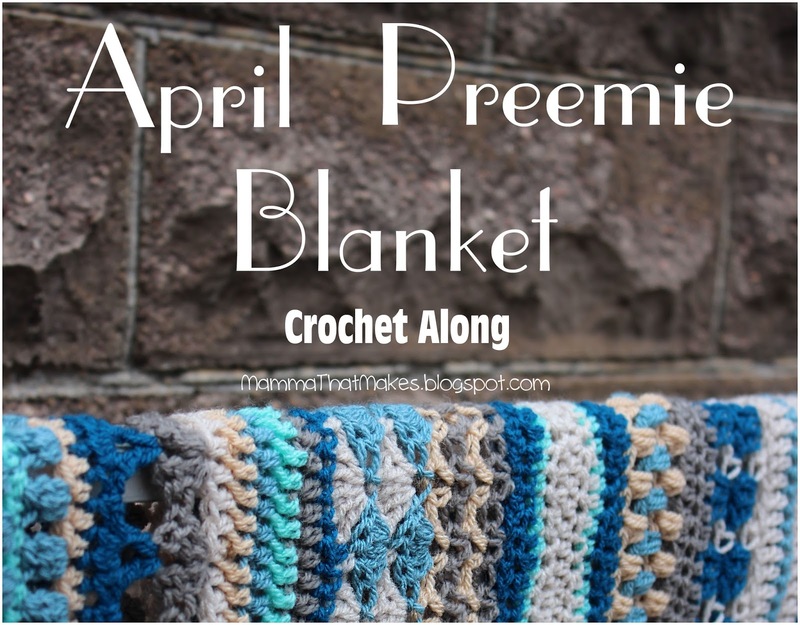 Lastly, don't forget to share photos of your completed blankets on Facebook, Tag them on Instagram as #AprilPreemieCAL or add them to Ravelry Or, you could do all 3! That's it peeps. Next month, we'll be back to our regular crafting program! Love ya's! 3: Ch3, turn, dc in each stitch across. 4: Ch4, turn, skip 3, sc in the next stitch. *ch3, skip 3, sc in the next stitch*, repeat across. To make a small puff: yo, insert hook into stitch, yo, pull through, yo, insert in same, yo, pull through, yo, insert hook in same stitch, yo, pull through, 7 loops on hook, yo, pull through all loops. 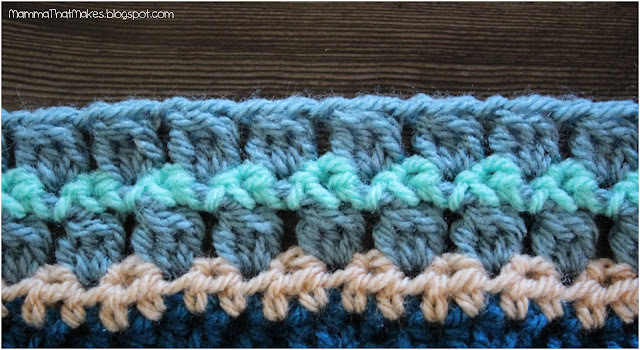 10: Ch2, turn, hdc in the first stitch, ch1, skip 1, small puff in the next, *ch1, skip 1, puff in the next stitch* repeat across, hdc in the last stitch. 11: Ch2, turn, hdc in the first stitch, ch1, skip 1, small puff in the space between the first 2 puffs, *ch1, skip 1, puff in the space between the next 2 puffs* repeat across, hdc in the last stitch. 22: Ch2, turn, (dc, ch2, sc) in the first stitch, skip 2 stitches, * (dc, ch2, sc) in the next stitch, skip 2 stitches*, repeat across, sc in the last stitch. 23: Ch3, turn, (dc, ch2, sc) in the next ch2 space, (dc, ch2, sc) in each remaining ch2 space across. 24: Ch3, turn, (dc, ch2, sc) in the next ch2 space, (dc, ch2, sc) in each remaining ch2 space across. 25: Ch3, turn, (dc, ch2, sc) in the next ch2 space, (dc, ch2, sc) in each remaining ch2 space across. 27: Ch1, turn, sc in the next stitch, 5dc in the next sc, sk2, sc in the next stitch, *sk2, 5dc in the next sc, sk2, sc in the next stitch*, repeat across, 5dc in the last stitch. 28: Ch1, turn, sc in the next stitch, 5dc in the next sc, skip 2, sc in the next stitch, *skip 2, 5dc in the next sc, skip 2, sc in the next stitch*, repeat across, 5dc in the last stitch. 29: Ch1, turn, sc in the next stitch, 5dc in the next sc, skip 2, sc in the next stitch, *skip 2, 5dc in the next sc, skip 2, sc in the next stitch*, repeat across, 5dc in the last stitch. DC Cluster - Keeping the last loop of each dc on the hook, dc 3 times in the same stitch, yarn over, pull through all 4 loops. 40: Ch2, turn, dc cluster in the fist stitch, *ch1, skip the next stitch, dc cluster in the next stitch* repeat across, dc in the last stitch. 42: Ch2, turn, dc cluster in the fist stitch, *ch1, skip the next stitch, dc cluster in the next stitch* repeat across. End off. If you need to remember which are the corners, place a stitch marker into the 2nd sc of each 3sc on all 4 corners. 43: Rejoin your yarn to the start of this row (Into the first dc cluster), so that the border is on the correct side. Ch1, turn, sc in each stitch and chain across, 3sc in the last stitch, turn your blanket clockwise and sc evenly down the side, working into the ends of the rows, when you reach the next corner, turn your work again clockwise and do 3sc into the first ch from the very first round, work a sc into each of the chains until you reach the next corner, make 3sc into the last of the chains and turn again clockwise. Work up the last side of the piece in sc, again in the ends of the rows. When you reach the first sc from this round, do 2 more sc's into that same stitch, then join to the first sc. 44: Ch3, dc in each stitch around, with the exception of the corner stitches (marked from the last round) in which you will place 3dc. Join to the first dc. If you need to know how to block your piece, and have used acrylic yarn lime I have, you can find some wonderful tutorials on Youtube. The one I first followed can be found here. Wow, here we are onto the border! How incredible is that! I can hardly believe that we're almost finished with our blankets. Just a little more to go, and we can call it a done and dusted. NOTE: If you need to remember which are the corners, place a stitch marker into the 2nd sc of each 3sc on all 4 corners. 43: Rejoin your yarn to the start of this row (Into the first dc cluster), so that the border is on the correct side. Ch1, turn, sc in each stitch and chain across, 3sc in the last stitch, turn your blanket clockwise and sc evenly down the side, working into the ends of the rows, when you reach the next corner, turn your work again clockwise and do 3sc into the first ch from the very first round, work a sc into each of the chains until you reach the next corner, make 3sc into the last of the chains and turn again clockwise. Work up the last side of the piece in sc, again in the ends of the rows. When you reach the first sc from this round, do 2 more sc's into that same stitch, then join to the first sc. NOTE: If you want to make your border any larger, this is where you would do it. Tomorrow's row is the finishing edge. If you want more stripes in your border, change colours, and dc around, always being sure to make 3dc in the corners, so the blanket doesn't curl in there. New? Keen to join in? Day 1 is here. Good morning all you amazing people! Day 28, and the last row of decorative stitches before we begin with the border. Now that's exciting! I really like clusters. If you've been following for a while, you'll have noticed that I use them quite a lot in hats. I like how they are little even defined shapes, and there is so much you can do with them! Jump back to Day 1 if you're just starting. Wow here we are on day 27, and only a handful of rows left to go. I want to take a moment to apologise for the dismal photography job for row 41! By the time I realised it was out of focus, it was far too late to go back and fix it. Oops! Like everyone else, sometimes I make mistakes. Thankfully it's a pretty simple row, phew! Looking for Day 1? It's here! Today, I was browsing Pinterest and stumbled onto some crochet jokes! You guys should know by now, I am a BIG fan of terrible jokes! I just can't help myself! The lamer the better! 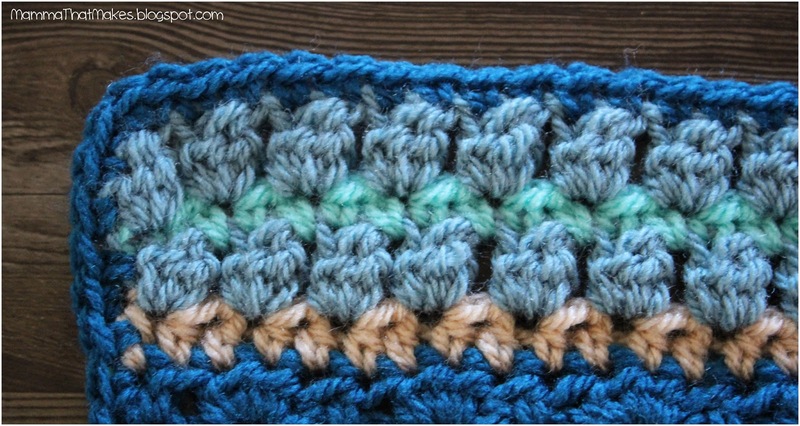 What happens if you dip a skein of blue yarn into the Red Sea? 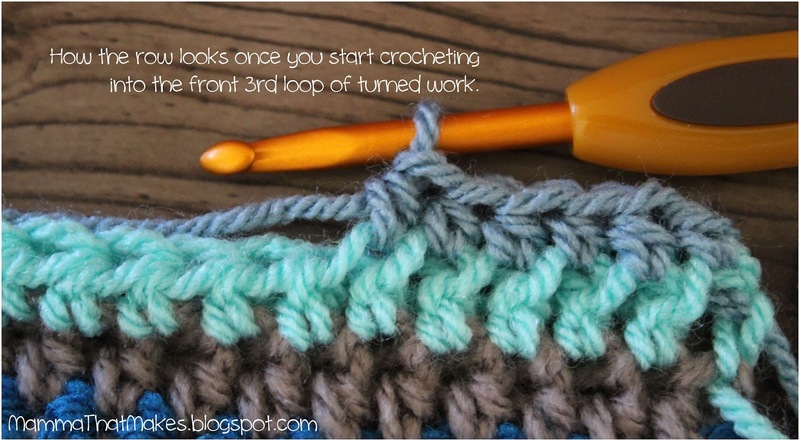 What do you call the steps it takes to crochet a project? 39: Ch2, turn, hdc in each stitch across. First time here? Jump back to Day 1 to start! Morning all! Day 25! WOO! April 25th is actually a pretty awesome day, it's World Stationery Day! I've been on a bit of a mission this year to make, create and send MORE snail mail (happy mail) and I am always on the lookout for fun stationery items, especially themed stuff! I love sending cards in the main and including stickers and paperclips for the recipient. Have you seen any cute stationery lately? Good morning all and hello day 24. Today we move into the second last set of decorative stitches before the border. This month sure has flown by, and it's been so amazing to see everyone sharing their progress with me! You guys are making some pretty beautiful blankets! 36: Ch3, turn, skip the first 4 stitches, *(2dc, ch2, 2dc) in the next stitch, skip the next 3 stitches*, repeat across, dc in the last stitch. Still time to catch up! Day 1 is here! Hello and good morning. Wow day 23 and we're getting closer and closer to finishing our blankets. Remember to check the notes for row 35 for those 3rd loop reminders. I really do like the texture those loops make when pushed forward like this. It has an almost knit look to it. I can see I'm going to have to use this technique again, I think it would look fantastic with variegated yarn. 34: Ch2, turn, hdc in the back loop only of each stitch across. Did you know that today, April 22nd is Jelly Bean day? YUM! Jelly beans were created in the mid 1800's, and have since become a popular favourite for many people, adults and kids alike. Jelly beans have come a long way over the years in terms of flavours, there are just so many! Personally, I like Jelly Belly brand the most, especially the watermelon ones, YUM! NOTE: Because we've turned the piece and are working in rows and not rounds, the 3rd loop will be in the front of the piece, instead of the back, where it would be in rounds. I've added some photos here for you, so you can see where I mean. Using this part of the stitch pushes the other loops forward in the front of the blanket creating a nice texture. 33: Ch2, turn, hdc in the 3rd loop only of each stitch across. Morning lovelies, and hello to day 21. April 21st is a pretty popular day as far as unofficial holidays go. It's record store day, kindergarten day and even husband appreciation day! It is also World Creativity and Innovation Day, which I think is pretty perfect for crafters! Have an idea? Why not try it! 31: Ch2, turn, hdc across. 32: Ch2, turn, hdc in the back loop only of each stitch across. Morning all and hello day 20. We're now 2/3's of the way through! Only 10 days left and we'll be all done. Gosh, that's gone fast! I have to I am really enjoying all of these stitches, and it's giving me some excellent inspiration and ideas for Septembers hat drive! 30: Ch1, turn, sc in each of the first 5 stitches, dc in the next stitch, *sc in the next 5 stitches, dc in the next stitch*, repeat across. Gosh it's been getting colder here lately, winter is moving closer and closer. Nothing warms me up faster than a crochet project and a hot drink! I'm in camp tea (no coffee!) and love a strong dark flavour with a dash of milk. Mmmm! What types of warm drinks do you enjoy? Starting out? Day 1 is here! We sure are powering through this month! How is everyone going? Are you keeping up? I am loving how my blankets are looking! Don't forget to share pics with me over on My Facebook Page so I can see the amazing colours I'm sure everyone picked! 27: Ch1, turn, sc in the next stitch, 5dc in the next sc, skip 2, sc in the next stitch, *skip 2, 5dc in the next sc, skip 2, sc in the next stitch*, repeat across, 5dc in the last stitch. Want to join in too? Day 1 is here! Morning all, and hello day 17! April 17th is the unofficial day of the Haiku! A Haiku is a poem that traditionally has three lines with 17 syllables. 5 Syllables on the first line, 7 on the second, and 5 again on the third. They don't have to rhyme, can be fun and quirky or deep and meaningful, and sometimes they make no sense at all! I had a crack at one for today! 26: Ch1, sc in the first ch2 space, 5dc in the next ch2 space, *sc in the next ch2 space, 5dc in the next ch2 space* repeat across.